For the first time since we were founded in 2013, legislation to protect homeschooled children from child abuse or neglect was introduced in two states — Iowa and Kentucky — during the same legislative session. In March, Executive Director Rachel Coleman, testified before a legislative committee in Des Moines; our research made a strong case for creating reasonable, effective protections for homeschooled children. In September, we reviewed draft legislation for a third state. We are working with more lawmakers today than ever before. Our work would not be possible without the support of people like you. You donate to us so that we can amplify your voice, and we take that commitment seriously. 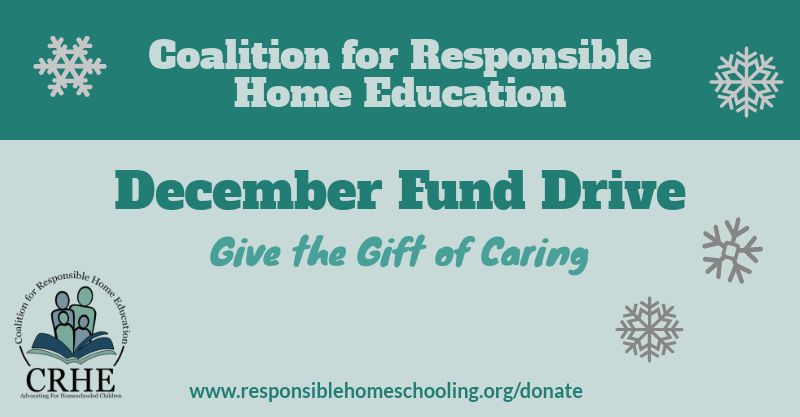 Please consider giving during our December Fund Drive. Help us advocate for homeschooled children. We are a 501c(3) nonprofit organization; your donations are fully tax deductible. By donating to CRHE you help us work toward a future where homeschooling is a child-centered educational option, used only to prepare children for an open future. OUR MISSION is to raise awareness of the need for homeschooling reform, provide public policy guidance, and advocate for responsible home education practices. OUR VISION is for homeschooling to be a child-centered educational option, used only to lovingly prepare young people for an open future.